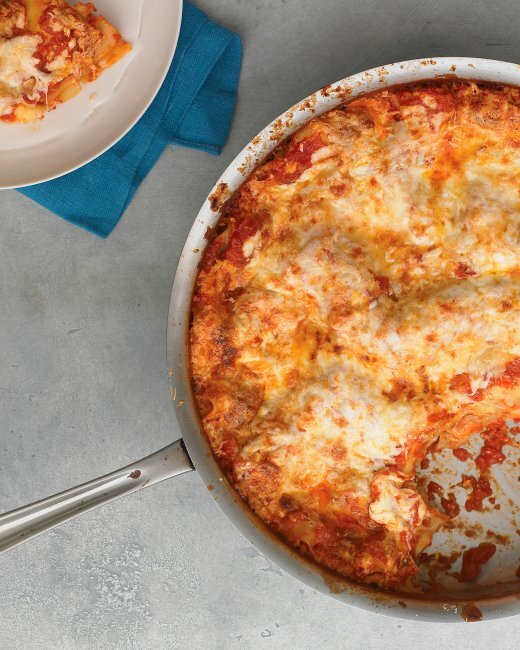 A simple garlicky tomato sauce and three Italian cheeses make this super-quick version of lasagna especially delicious. Step 1 Preheat oven to 400 degrees. In a food processor, pulse tomatoes until coarsely pureed. In a large deep skillet, bring tomatoes, garlic, and oil to a boil. Season with salt and pepper. Reduce to a simmer and cook on medium until thickened, about 12 minutes (you should have 5 cups marinara sauce). Step 2 Meanwhile, in a medium bowl, mix together egg yolk, ricotta, and 1/2 teaspoon each salt and pepper. Step 3 Carefully pour sauce into a heatproof bowl and return 3/4 cup to skillet; spread sauce evenly. Add a single layer of noodles, breaking them up to fit. Top with half the ricotta mixture, spreading evenly. Follow with a second layer of noodles, then 1 1/2 cups marinara. Add a third layer of noodles, then remaining ricotta mixture. Follow with a final noodle layer, then remaining sauce. Sprinkle mozzarella and pecorino over top. Step 4 Bake lasagna until golden and bubbling, 30 to 35 minutes. Let stand 10 minutes before serving.